Hailed as the good-time ten-piece band that has toured Europe, the UK and has released a huge library of acclaimed albums, Bill Wyman’s Rhythm Kings have continued that musical journey that Bill started after he left the Rolling Stones in 1992. With its core of regular members, as well as a rotating who’s-who of music fame and talent, Bill Wyman’s Rhythm Kings have now pulled together a three volume compilation of albums – both live and studio – as well as exclusive bonus material into a series of collectors’ box sets. The albums are available to buy on iTunes and also Amazon as CD boxsets. This box contains the first four releases from Bill Wyman’s Rhythm Kings, the good-time ten-piece band that Bill Wyman put together after leaving the Rolling Stones in 1992. CDs 2 and 4 are recordings from the band’s live shows originally given a limited release as the ‘Bootleg Kings’, and unavailable for many years. The 24 page booklet contains all the credits and brand new annotation by Tony Rounce. This second box in our series contains another four CDs, a record of Bill Wyman’s Rhythm Kings’ work from 2000 to 2002. The twelve-piece band that Bill put together after leaving the Rolling Stones in 1992 recorded three albums in this period, “Double Bill” being a 2 CD set. Disc four, the live “Travlin’ Band”, has previously only seen a very limited release. The band has a core rhythm section, but features a revolving combination of all-star guest front men and women. These recordings feature the talents of Gary Brooker, Georgie Fame, Albert Lee, Andy Fairweather Low, Chris Rea, Beverley Skeete, Mick Taylor and George Harrison (amongst his last recordings) on an intriguing and varied selection of covers and originals. The 28 page booklet contains all the credits and new annotation by Tony Rounce. 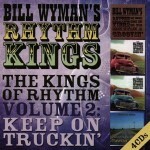 This third box in our series contains Bill Wyman’s Rhythm Kings’ CD releases from 2003 to 2011. The twelve-piece band that Bill put together after leaving the Rolling Stones in 1992 issued four albums (Just For A Thrill, Live, Live Communication) in this period, including a long-unavailable Bootleg Kings set (On the Road Again). The band has a core rhythm section, but features a revolving combination of all-star guest front men and women. These recordings feature the talents of Mark Knopfler, Dennis Locorriere, Gary Brooker, Georgie Fame, Albert Lee, Chris Stainton, Mike Sanchez, Andy Fairweather Low, Beverley Skeete, Terry Taylor, Geraint Watkins and Lonnie Donegan. The booklet contains all the credits and new annotation. I’m expecting the vol. 4 with 3 DVD’s announced in the booklets of the first three box sets. Does anybody know when the vol. 4 will be released?